I have also had the fear of being diagnosed with diabetes due to my unbalanced lifestyle and my families history in diabetes. 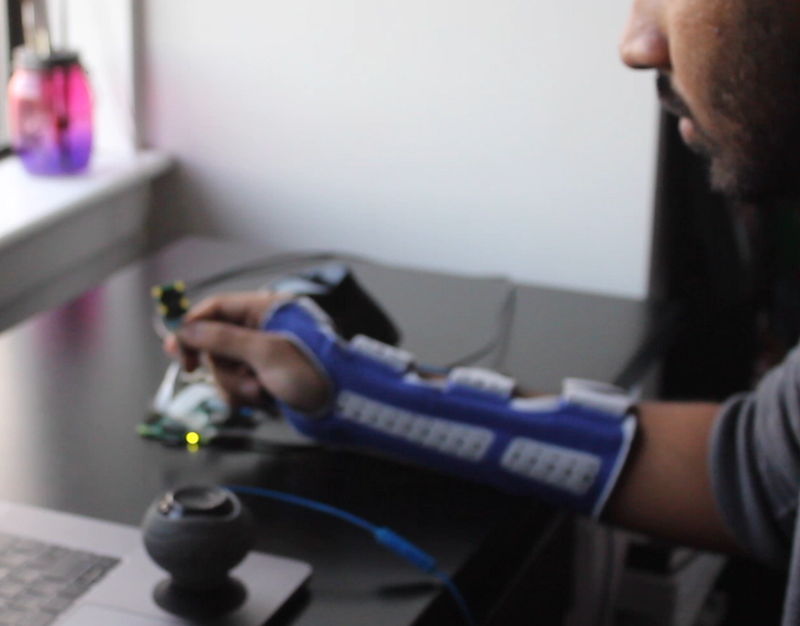 During my third year at Emily Carr University of Art & Design, we had an opportunity to research and design a conceptual product based on a chronic health condition. 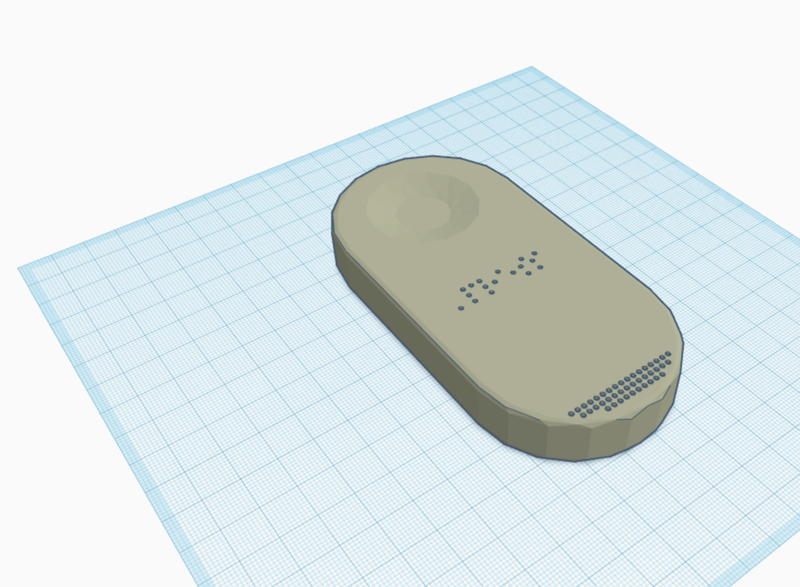 To put my fears at rest, I took the challenge to address vision loss due to diabetes type 2 and this leads me to research and design a product that can help elderly and visually impaired diabetic patients and anyone with vision problems to lead a life with no boundaries. The final product was prototyped and designed using “Raspberry pi W” and Google API (Vision, label, logo). With over “25.8 Million” diabetic north Americans suffering from partial or complete blindness due to diabetes under the age of 65. 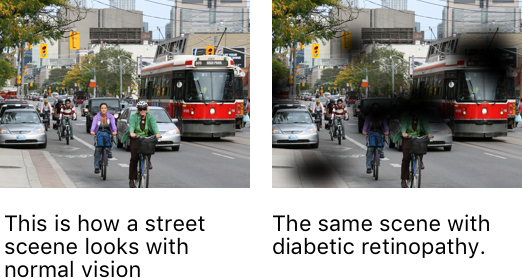 Diabetic retinopathy is the common cause of eye damage in most diabetic patients, which leads to “blurred vision, spots in vision, sudden loss of vision and flashes of light in the field of vision”. In my research I have observed that there isn’t a product that’s meeting the needs of partially blind or completely blind diabetic patients, I took this as an opportunity to address the needs of these patients and also extending the product to everyone who is in need of a similar product. 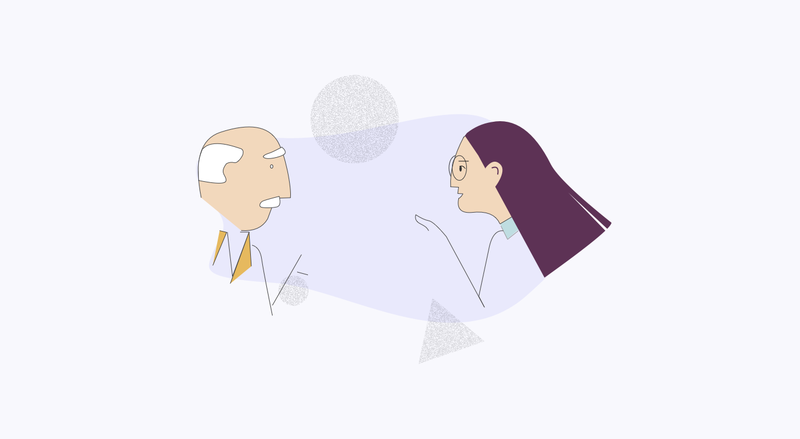 Initial research for the project surrounded around helping elderly diabetic patients in understanding their food intake and providing inputs on how to limit the risk of high blood glucose levels. As the research progressed, my focus shifted onto both elderly & visually impaired (including diabetic) individuals. Below are the three areas I have done extensively researched on through different activities. Logging daily food intake using a stand alone camera device or a smart phone camera with image recognition software that can recognize different food by type, state (cooked, raw etc.,) and calculate calories instantly. Using this info, creating a healthy diet either by the app or by a dietitian to control blood glucose levels. Simplifying daily activities like reading, recognizing objects on web/real-life objects and people using image recognition software that pre-stores static and moving objects information for instant voice feedback. Creating a safe environment while in commute. Using proximity sensors and image recognition, the device alerts the user when in need (stop/walk/react). This study was done to understand the lifestyle of a diabetic patient. For 1 Week, I was wearing loose clothing which would allow me to easily access my arm and abdomen to take insulin shots. I also had to take care of my skin to prevent skin ailments, this required clothing that allowed air to circulate indoors and outdoors. To enact as a Diabetic patient, I had to totally change my diet and be more physically active. This involved trips to the organic section in the store and eating fewer carbs (Rice is a staple food at my home, it was hard not to have rice for 1 week).I also had to carry insulin shots everywhere and check my blood glucose level twice a day. It was hard to keep up with constant medication, carrying two pouches of medical equipment, food preparation, and workout. Poking my fingers to test blood glucose level was the most frustrating thing as I had to poke multiple fingers (used a needle to experience the pain). - A meal plan would have helped in creating a healthy diet. This way I don’t have to spend most of my time at the grocery store and food preparation. - Medication was a hassle a I had to manage my day to day activities around medications. Poking my fingers with a needle for 1 week was painful! 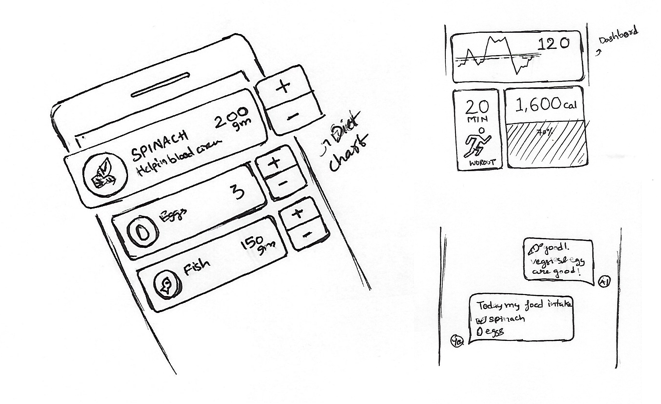 During the initial ideation, I was more drawn to solutions that were readily available in the market to log food, activities, movement and navigation (see below sketches). But as the ideation process progressed I realized that the current products are most attached to an eco-system (Apple iOS or Android), which limited my opportunity to explore more ideas. 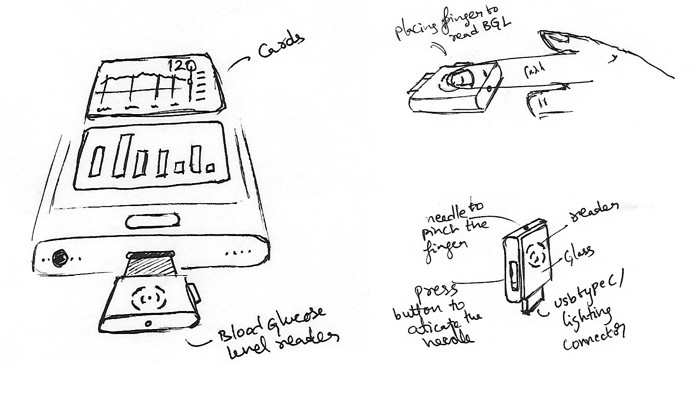 Upon further research and conducting interviews with diabetic patients, I change my approach from creating an app to building a standalone device. AI app connected to the glucose meter and provides diet and workouts. The patient can manually enter the food portions for reliable output. Mini glucose meter with a needle which is used to pinch the finger. Using the sensor on the top of the meter when connected to a smart phone sends the data directly without the use of strip! 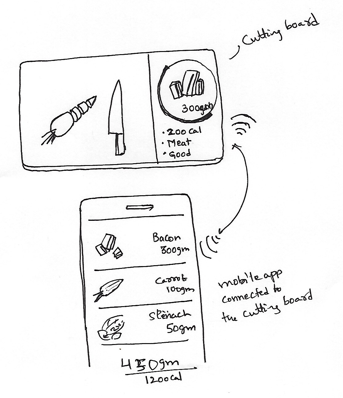 The smart cutting board in 3/4 is common wood board and the rest 1/4 is a smart scale, food sensor which detects food and gives ratings on the food that is being consumed (can be paired with an app). Upon further research, I stuck with three main aspects (based on research activities done during the 3rd year of my bachelors) which are simplifying everyday activities, accessible education & Internet and navigation. 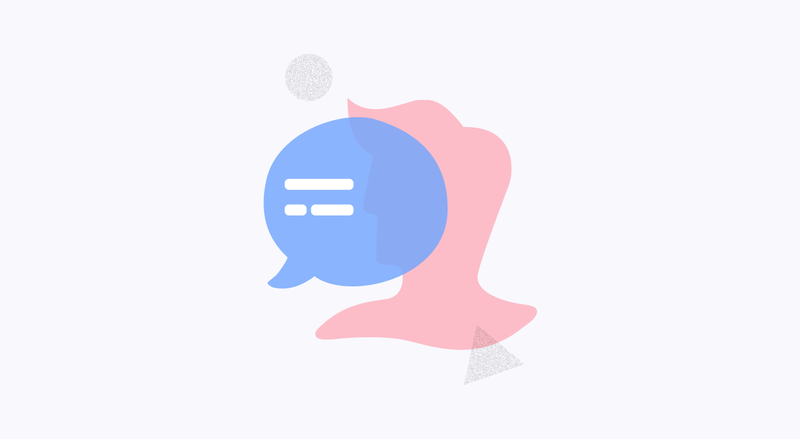 Simplifying activities like reading, recognizing images, text on the web, people by using an image recognition API that can pre-store static and moving objects information to deliver responses that are accurate and understandable. Object recognition can help in understanding the world around and deliver responses that can help in navigating the space with freedom. Feature: Logging daily food intake using the camera device with image recognition software that can recognize different food by type, state (cooked, raw etc.,) and calculate calories instantly. 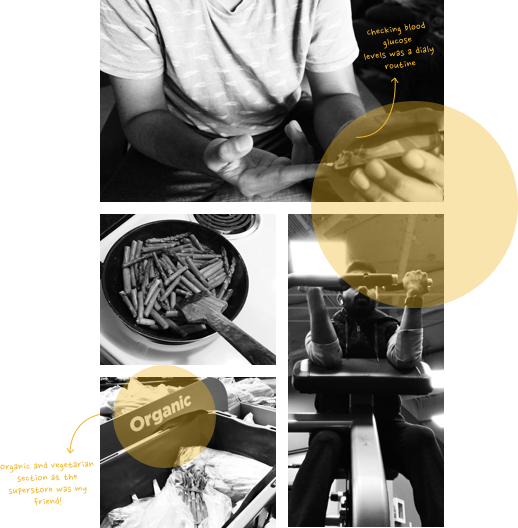 After the research and initial ideation process, I re-worked on the concept that did not depend on a smartphone. As I felt all my ideas were leaning towards a smartphone app. With further ideation, I moved towards a standalone product with a camera, speaker and inbuilt battery. Which does not depend on any device and would work dependently with the need of a smartphone. Keeping accessibility as the key, the device is designed to operate using a single button in the front with protruding 3D designed braille letters which convey the letters “Press”. A single 8 mega pixel camera, speaker, microphone and a in-built battery are also placed in a compact hand held form. 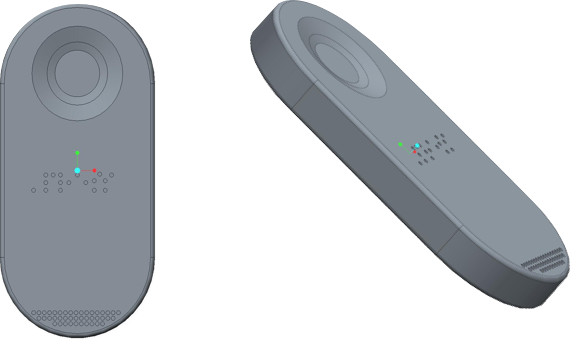 The initial prototype was made using a cardboard to get an idea of how the device would look visually, size of the device in different hands, placement of camera and buttons. 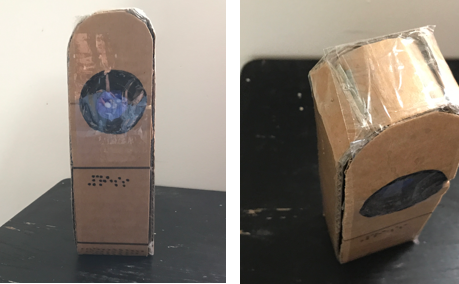 Once I had a better idea after experiencing the design, I used the cardboard prototype to test different scenarios ranging from the point it at people, objects to understand how different people would perceive their surrounding when handling a standalone device. 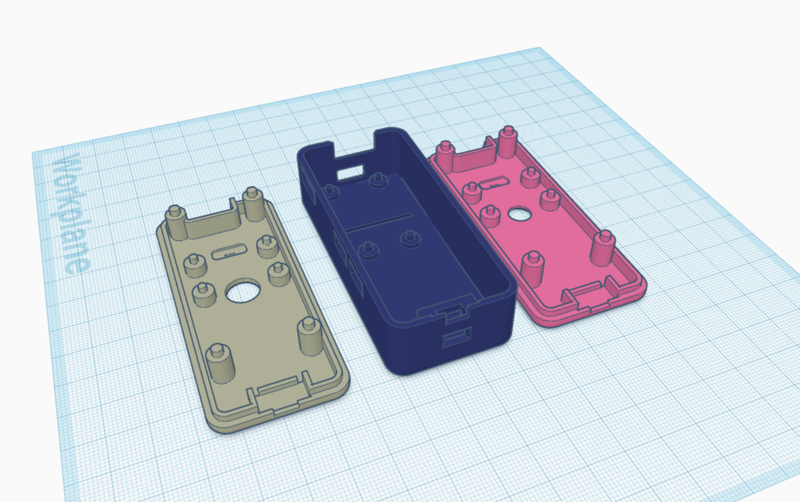 Next step was to create a 3D rendering using Tinker CAD and then 3D printing it using “Generic Standard PLA” (3D Hubs (https://www.3dhubs.com) was a great help in outsourcing the printing job to a local 3D printer owner). 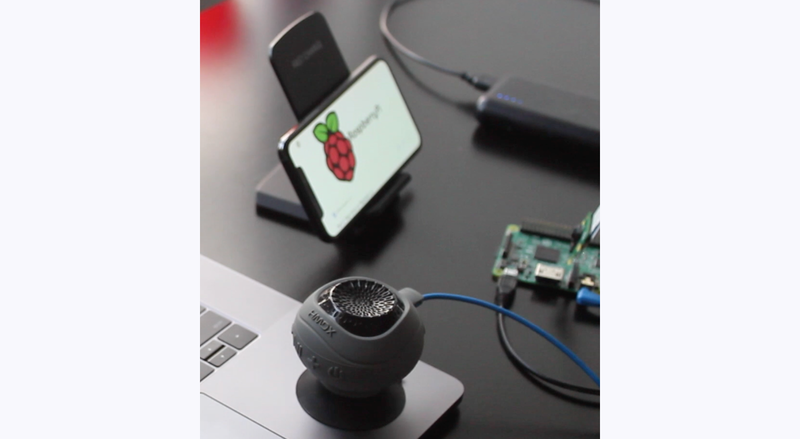 For this project, I have used a Raspberry Pi W as a prototyping tool to create a prototype that can respond to user commands, take images and provide minute details regarding space, food, people, and objects.Google API was a savior in this process as I was able to use their vision, label and logo API for free to test out different use cases and scenarios. Every project, personal or client, I tend to get attached to my initial ideas and try iterating on them. After working on this project, I took a different strategy where I approached every concept as a better than the prior. 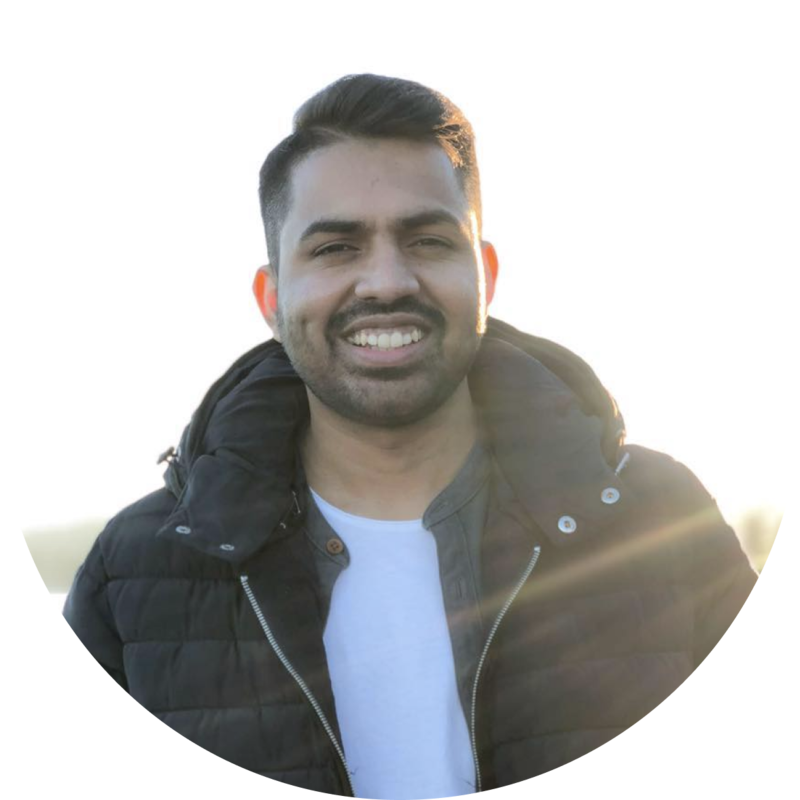 This approach allowed me to explore beyond a smartphone and venture into physical standalone products that work independently. Most of my initial ideas were smartphone applications which were visually appealing and had many features. But the app is attached to a platform and was too dependent on how the software can achieve or address different use cases. Another reason was the cost of the smartphone, as the app required high-end specifications to run all the API’s, this route did not seem viable if I’m planning to expand the service across the world.You should always be willing to let go of your good ideas to build better ones which are accessible for everyone without any boundaries.